Well Pumps – Finish Thompson, Inc.
Water is pumped into this tank until it reaches a certain pressure, usually between 40 and 60 psi, and then the pump is shut off. When the water needs to be accessed, the pressure within the tank pushes the water to the desired destination. The pump will come back on once the pressure within the tank is reduced below a specific threshold. Well pumps come with various amounts of horsepower. As would be expected, greater amount of horsepower is needed to pump water longer distances and to pump larger amounts of water at one time. Therefore, if you must draw water from deeper underground, a larger motor must be used. In addition, well pumps supplying flow to more than one location will need to have more horsepower. There are two types of well pumps: shallow well and deep well. 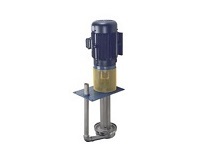 Well pumps come in a variety of offerings: hand water pumps, solar well pumps, jet pumps and submersible pumps. Knowing the depth of the water table is another important factor in choosing the proper well pump for water extraction needs. For example, jet pumps are commonly used for shallow wells, while submersible pumps are much more effective for pumping water from deeper water sources. Well Pumps Well pumps help move water from an underground water source through pipes leading to another location within a home or business. Well water pumps contain a motor, which spins a blade. This blade creates suction and draws the water into the pipes. Once the water is drawn up from the underground water source, it usually pumped into a pressurized storage tank.